Customized map: view from space with an overlay showing geographical zones. Argent is 100 km east of Jo'burg. South of Bronkhorstspruit. Moepe Mine - Pilanesberg Mt. Weak Fluorescence, SW light violet, LW light green. The Bushveld complex is a large, layered intrusive. It contains many magmatic ores, pegmatitic and hydrothermal ore deposits and has metamorphosed the floor rocks of the intrusive. The major deposits are of platinum group elements, chrome, nickel, vanadium and uranium. 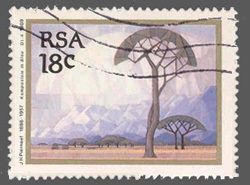 The complex occurs in a number of South Africa's provinces. Abandoned tungsten deposit on Krantzberg Mt., on Farm Pristelwitz. Restricted access. Located 30 km from Usakos. Not fluorescent, according to Rob. W.
Private claim. 30 km SE of Otjiwarongo. Small quarry just south of Wlotzkas Baken, approx. 2.3 km east of the coastal road between Henties Bay and Swakopmund. Calcite, dolomite, tremolite at Quartzberg, Hakos Mts. Tsumeb has produced large tarnowitzite crystals up to 20 cm. Tsumeb mine, Giant crystals location, Farm Verloren, Hakos Mts. Apply for Prospector's Licence from the Dept. of Mines office in Windhoek (supposed to apply for this six weeks prior to entering Namibia) and Export Permits. Namibia is slightly less than half the size of Alaska. "Tsumeb is one of the greatest mineral localities of all time. It's famous for zinc, lead, cobalt and copper minerals. 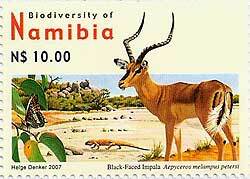 The total mineral species count from this area has topped 300 and over 20 of them are found only there." "The Tsumeb Mine, Tsumeb, Namibia, Africa is widely thought of as the premier mineral locality in the world. This mine produced more variety of truly superb minerals than anywhere else in the world. The mine closed over two decades ago." The Namib Desert has changed little for 100 million years. It's the oldest desert on Earth. Careful not to collect any rare "Para-site"